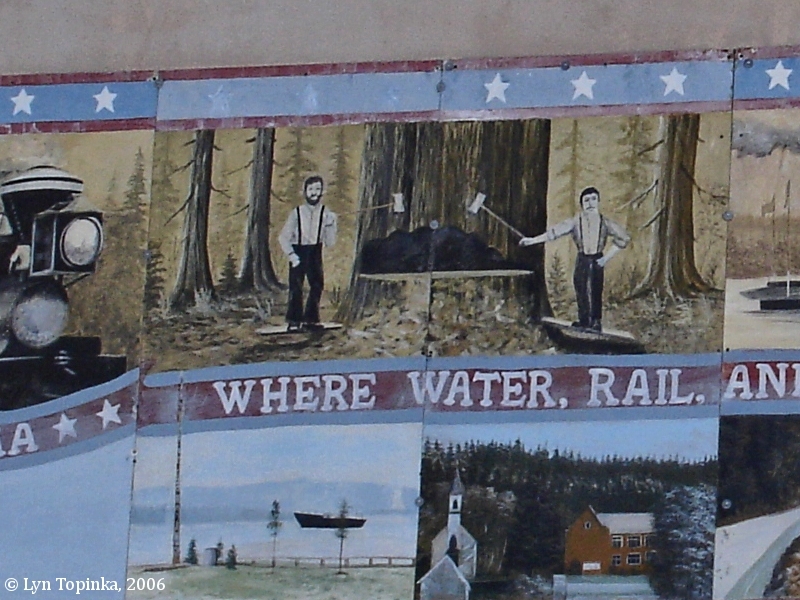 This mural was dated 1776-1976 and called "Kalama, Where Water, Rail, and Highways Meet". 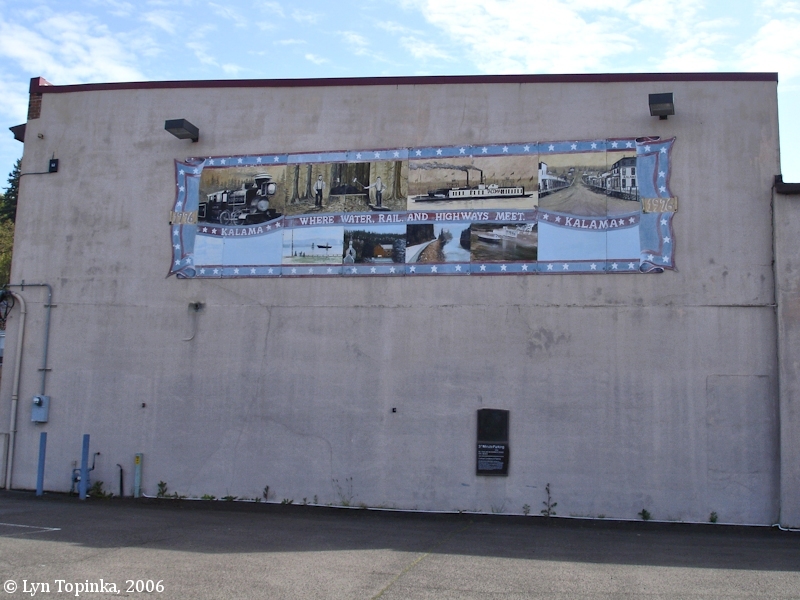 It was located on the side of a building and visible from Interstate 5. By 2007 this mural had been painted over or otherwise removed. 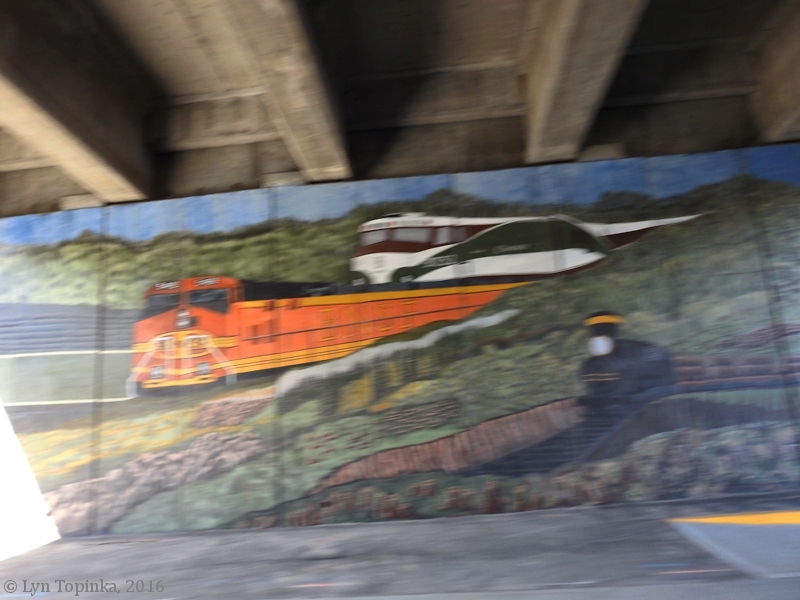 "KALAMA — A drab freeway underpass is being transformed into a work of art. 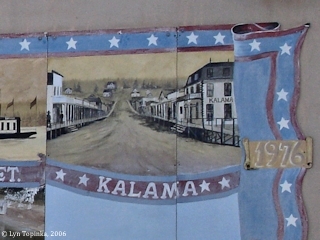 Starting at 8 a.m. Saturday, volunteers are invited to help paint a mural depicting the history of Kalama’s waterfront. The underpass is located in north downtown. 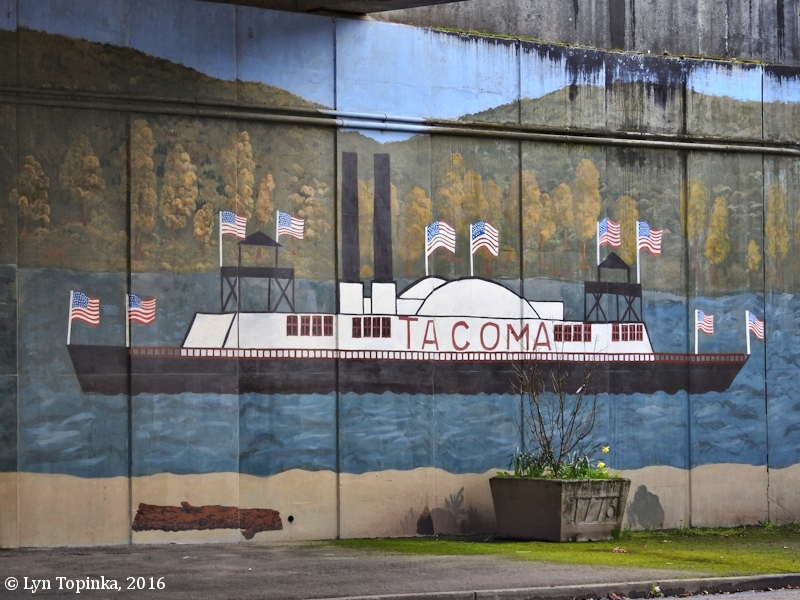 Five boats — American Indians in a canoe, the Lewis and Clark Expedition, a sailing ship, the historic Ferry “Tacoma” and a modern tanker — and background scenery already are outlined for painters on the concrete wall. Kalama Public Works Director Carl McCrary had the idea; Kelso Eagle Scout McKay Graff is making it a reality. 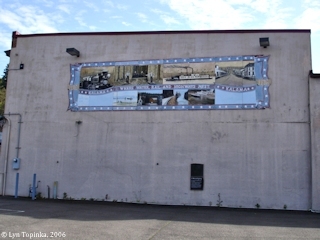 For months, the pair have reviewed McKay’s sketches for the mural and got permission from state highway officials and the Kalama City Council. 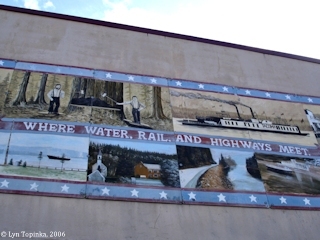 McCrary contacted the Cowlitz Tribe and Cowlitz Historical Society to help make the drawings as historically accurate as possible. It’s an Eagle Scout project much bigger than McKay, a Kelso High School sophomore, expected. So far, he’s spent about 30 hours preparing and pressure-washing the site for Saturday’s gathering. To transfer his sketch to the concrete wall, McKay first divided the wall into several squares to keep the images in proportion. McKay said he’s never considered himself an artist, but he’s had fun creating the mural. “It’s something that will stay for a long time and impact the community,” he said. 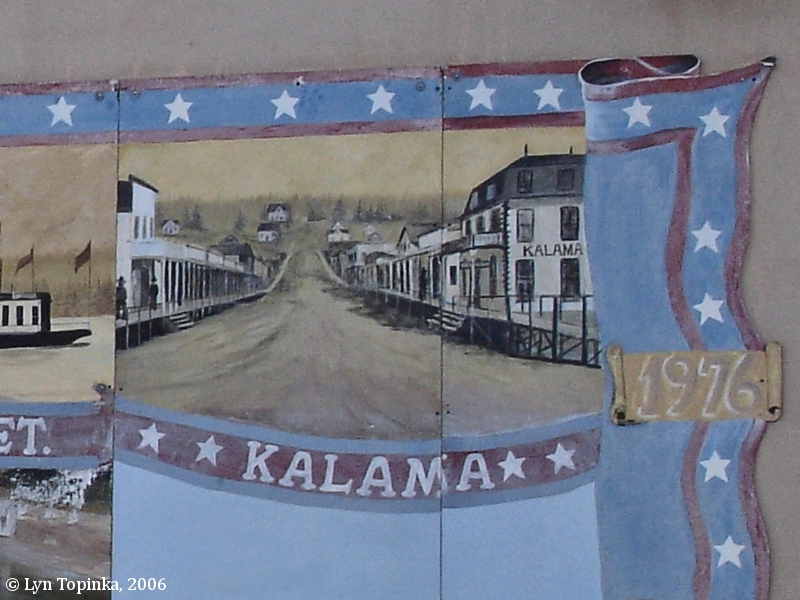 Kalama resident Danni Pederson said she’s glad to do her part to spruce up Kalama and honor local history. “It’s having people see this is a pretty decent place to live,” she said. Volunteer Shirley Lowman said painting the mural is an opportunity to connect people to their community. It will help bridge both sides of Kalama, which are separated by I-5, she said. “We feel it links the downtown with the port,” she said. Absolute Concrete Colors, a Kalama company, is donating the paint, and Star Rentals of Longview is donating a lift. The Washington Department of Transportation is contributing a protective top coating. “Everything has fallen into place,” McCrary added. He’s already brainstorming ideas for another history-themed mural on the opposite side of the underpass. Among other things, it will highlight Kalama’s railroad history, but McCrary said has not started planning the project yet. McKay said he’s excited to see volunteers on Saturday. His only request is for volunteers to bring their own paint brushes. “It’s B.Y.O.B. — bring your own brushes,” McKay said." Source: Leila Summer, September 11, 2009, "The Daily News", retrieved online 2016. 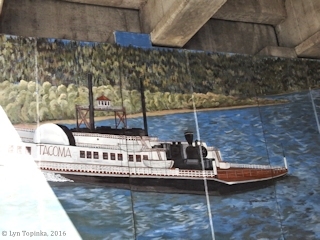 Click image to enlarge Detail, "Tacoma" Train Ferry, south side Underpass Mural, Kalama, Washington. Image taken March 6, 2016. 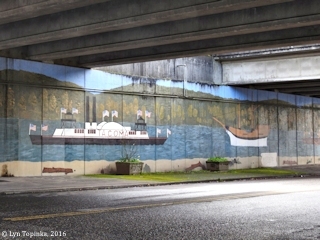 "KALAMA — The freeway underpass in Kalama is getting another artistic upgrade. 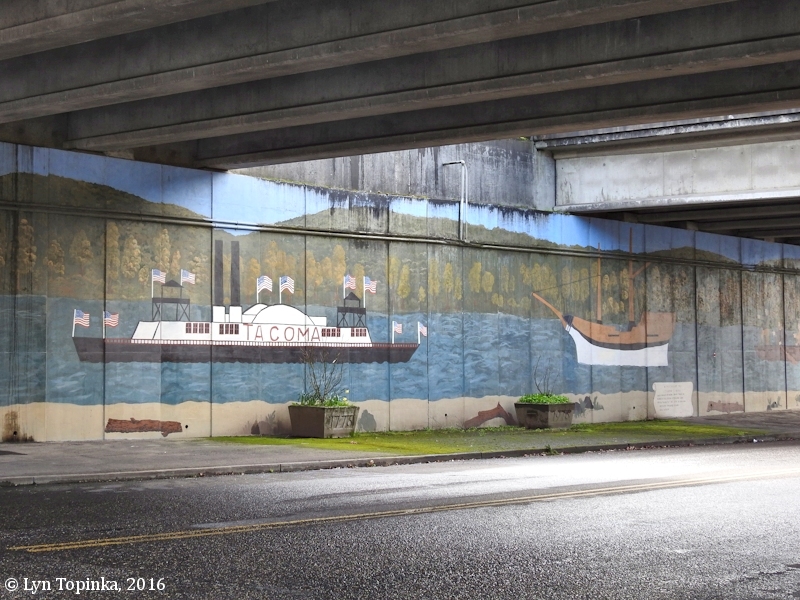 Organizer Shirley Lowman and retired Evergreen School District art teacher Danni Pederson are rallying a community effort to paint a mural on the north side of the underpass. In 2009, Both helped Kelso Eagle Scout McKay Graff paint a mural on the south side of the underpass. 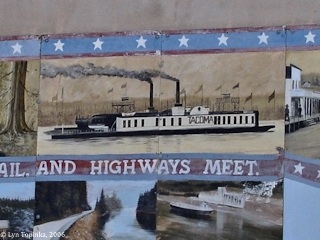 It depicts the city's historic waterfront. 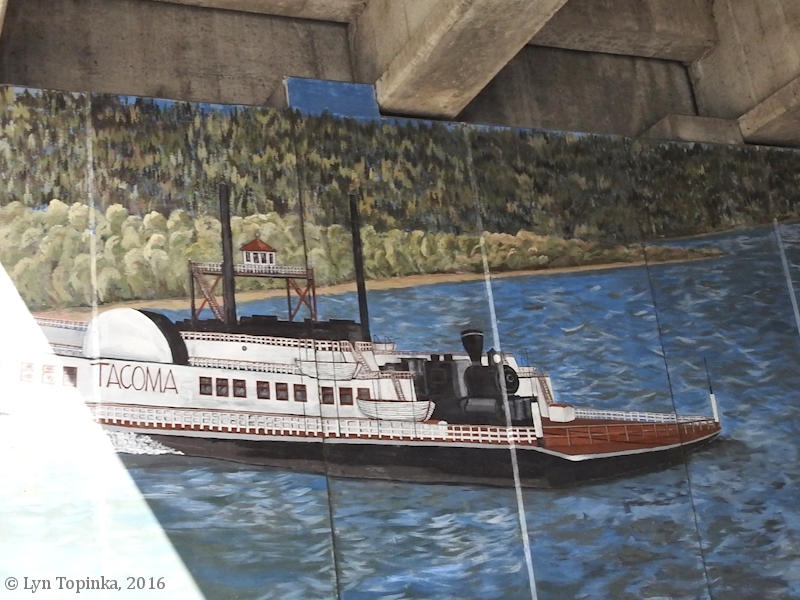 The new 145-foot-long by 15-foot-high mural will show the evolution of trains over more than a century. 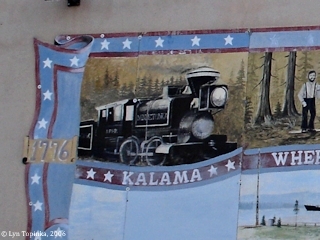 "Kalama has a big history with trains," said Pederson, 61. 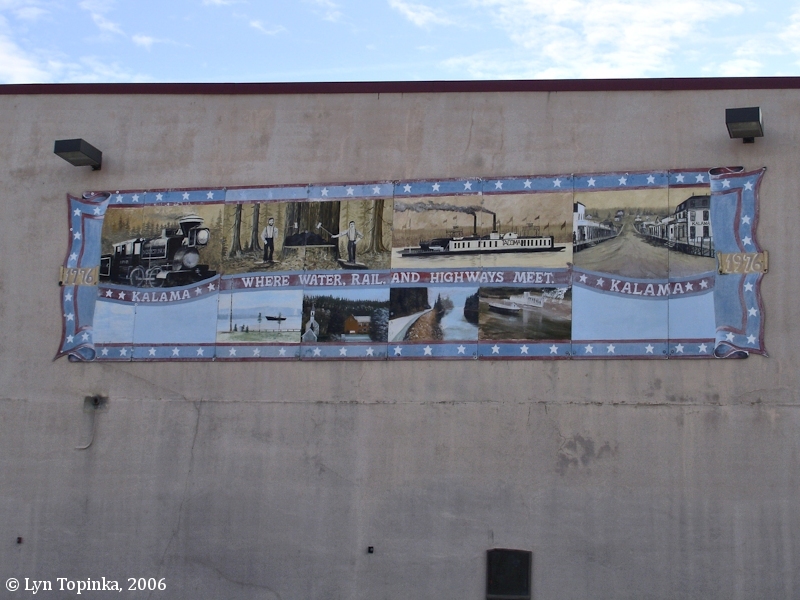 Kalama touts itself as a place "Where Highway, Rail and Water Meet." 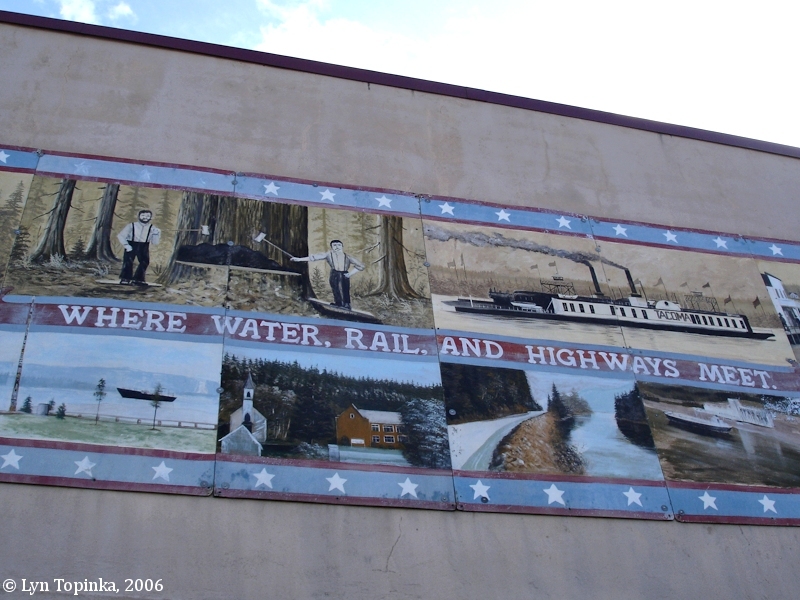 The town was the terminus of the Great Northern Railroad when that company linked the Pacific Northwest to Chicago in the late 19th century. The city remained rail hub well into the 20th century. "And it'd be really nice to have with all the train buffs here. ... We enjoyed seeing the other wall so much, we want to see what this one will look like," Lowman said. The mural will depict the transition from the Minnetonka locomotive in the late 19th century all the way to today's Amtrak. It also will include an image of the town's train depot, demolished decades ago. 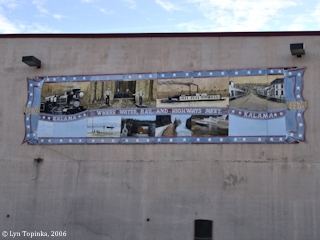 The two studied the history of rail and its connection to Kalama to make the mural as historically accurate as possible. Pederson and Lowman have been etching out a rough sketch of the design with charcoal since Tuesday, assisted by Jan Tishner, 63, of Ridgefield, and Brindi Kisamore, 18, of Kalama. The quartet first divided the wall into squares before beginning to transfer their design onto the underpass concrete. They hope to begin painting by early next week. "The drawing is the hardest part," Lowman said. "The painting just takes time." The group is still looking for volunteers, with or without art experience, to help with the effort. "We want to hurry up and get it done because when the weather turns," Lowman said, "it turns." Absolute Concrete Colors, a Kalama company, has donated supplies to the project, but Lowman said they probably need another $1,000 in paint to complete the project. "It's a community project that will make a beautiful entrance into town," Lowman said." Source: Marqise Allen, August 30, 2012, "The Daily News", retrieved online 2016. Click image to enlarge Detail, Underpass Mural, north side, Kalama, Washington. Image taken March 6, 2016.